The 918 Spyder. 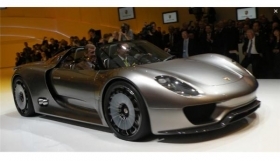 pictured, is one of three hybrid models Porsche presented at the Geneva auto show in March. BERLIN (Bloomberg) -- Porsche AG may price the 918 Spyder, which accelerates to 100 kilometers an hour in 3.2 seconds, at 500,000 euros ($630,000), topping the Carrera GT as its costliest model, according to two people with direct knowledge of the plan.